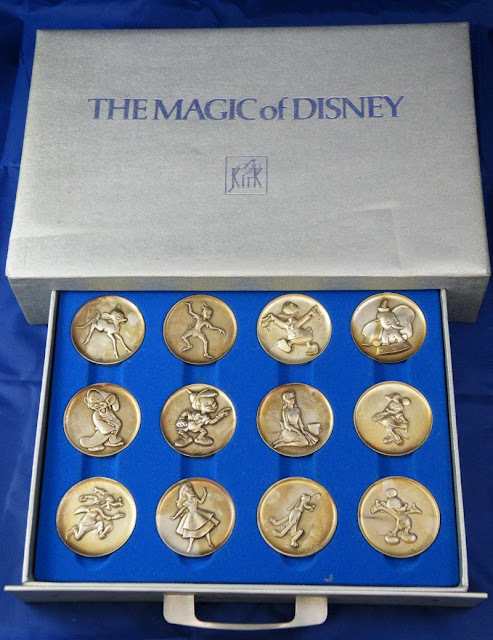 The Magic of Disney is a 1973 collection of twelve 2.3 oz. 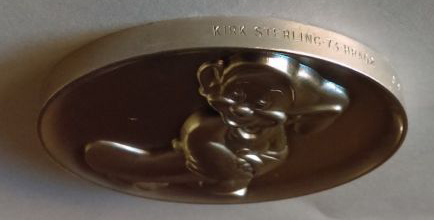 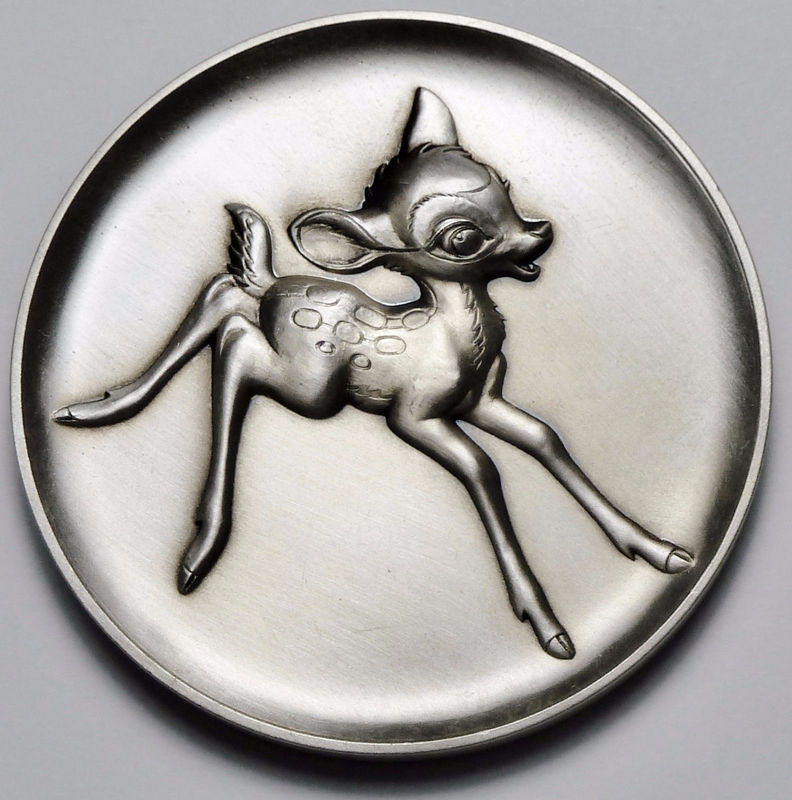 sterling silver coins issued by Kirk. High relief detail. 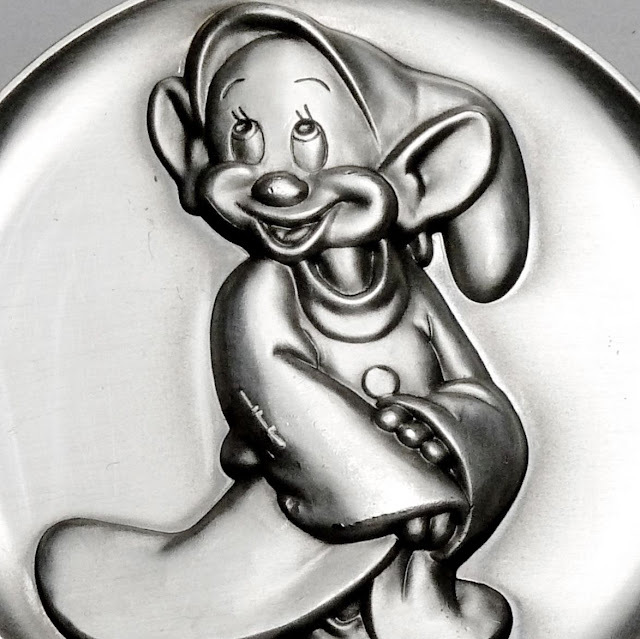 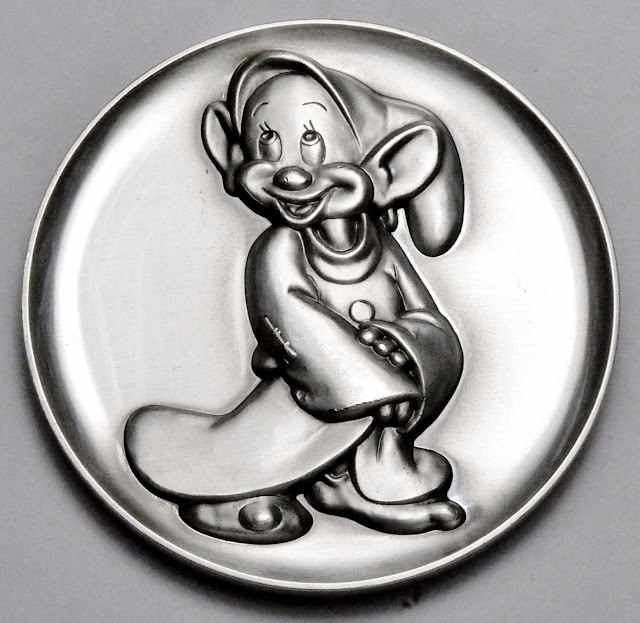 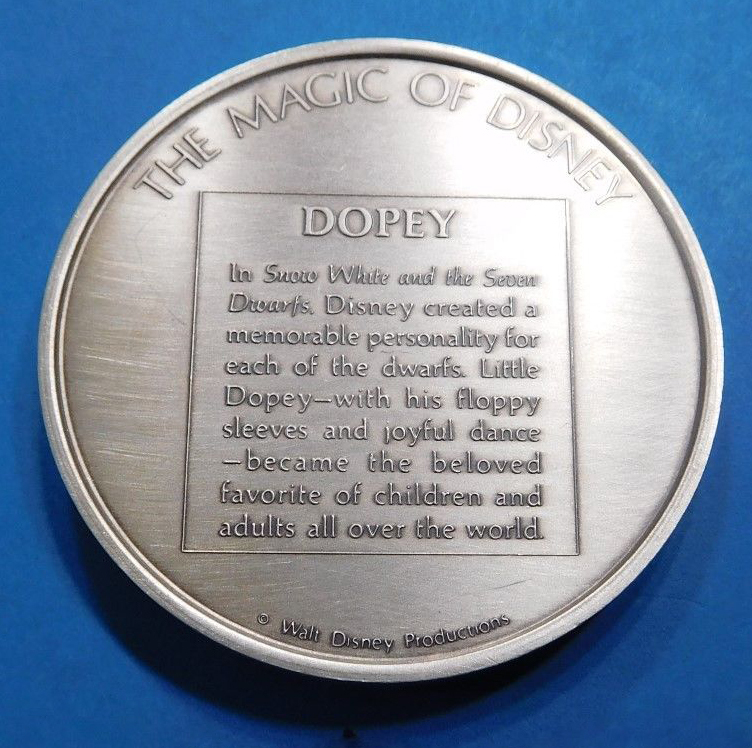 Included in this limited edition set is a Dopey piece. On the back is a short character bio. 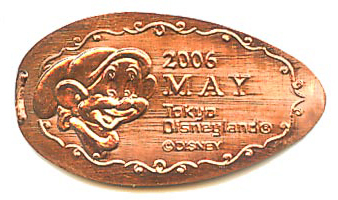 Stamped along the side edge is the Kirk production year. 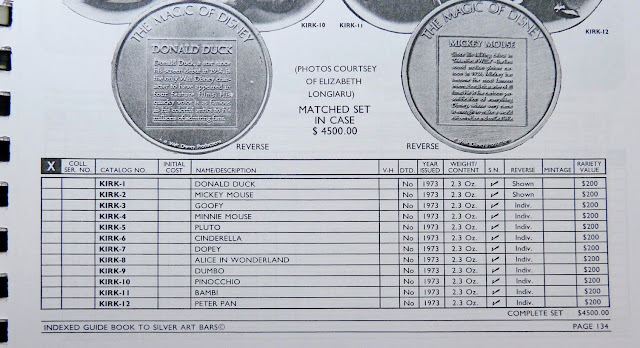 They began issuing these rounds in 1973, yet later mintings were completed in 1974. 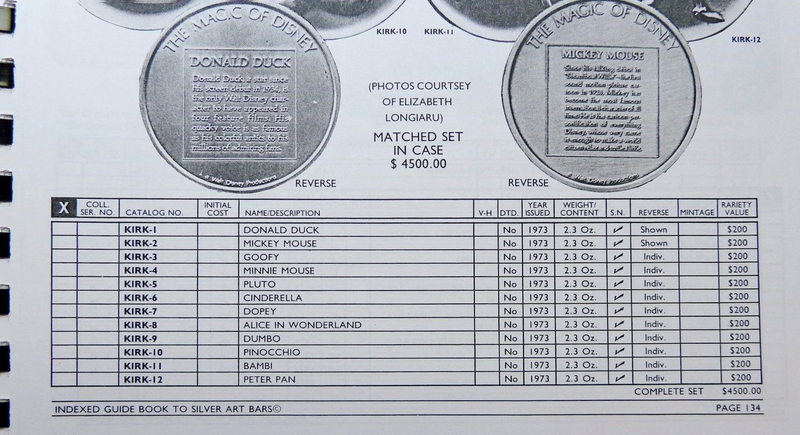 Thus the coins will have either "73" or "74" mark. 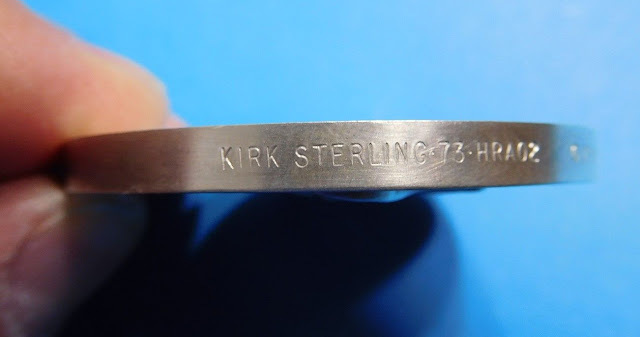 Also included is the Kirk serial number and the individual coin number within the edition. 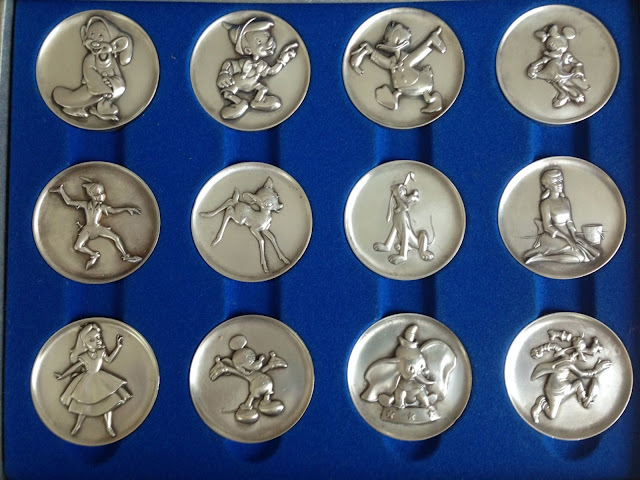 The other characters in the collection are Donald Duck, Mickey Mouse, Minnie Mouse, Goofy, Pluto, Cinderella, Alice in Wonderland, Dumbo, Pinocchio, Bambi, and Peter Pan. The coins are listed in the Indexed Guide to Silver Art Bars, p.134. Images via silverfield + scriptwriter3. 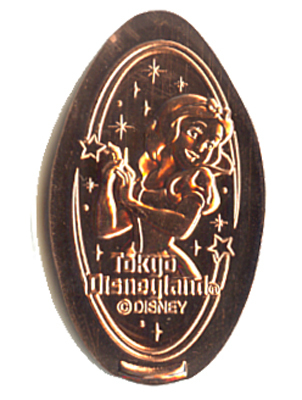 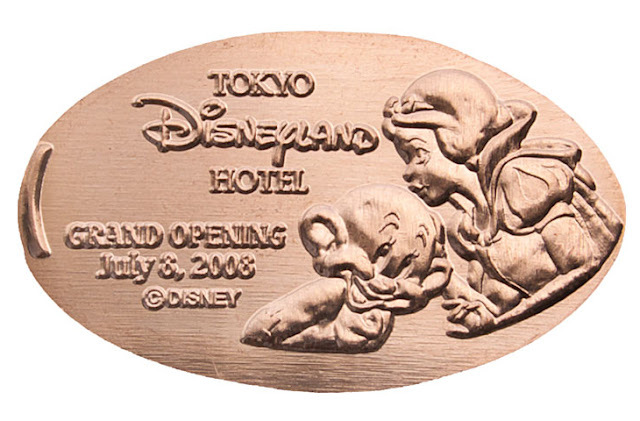 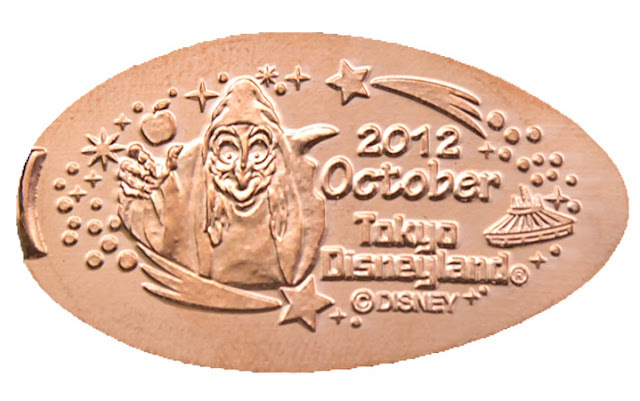 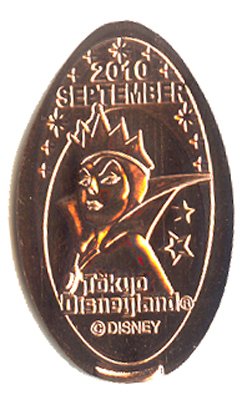 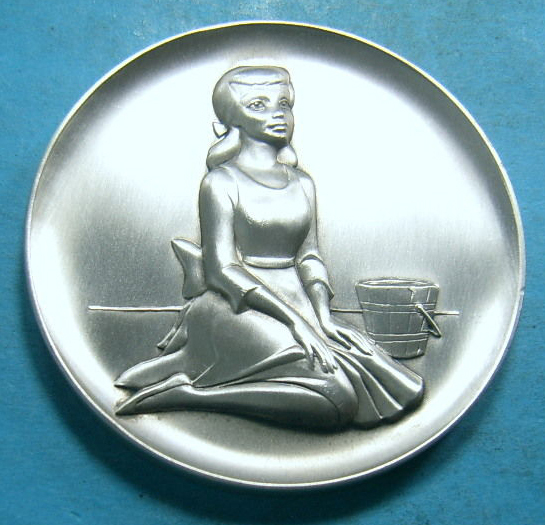 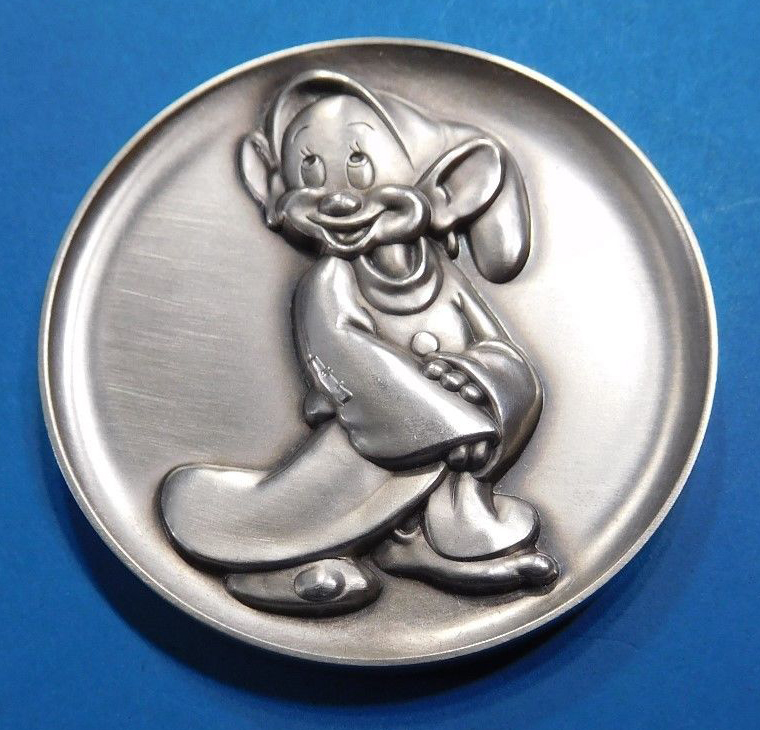 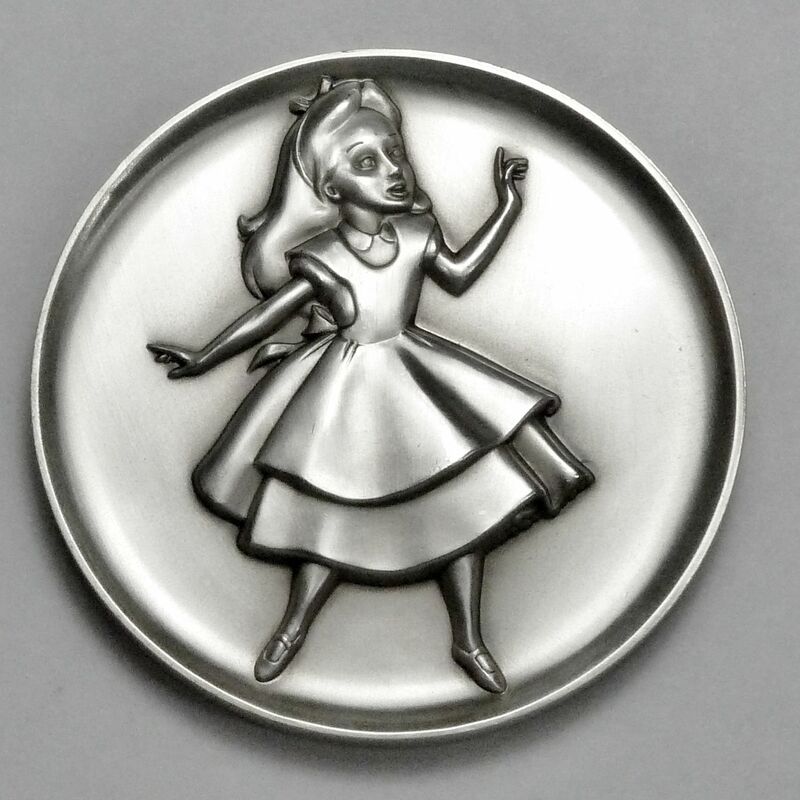 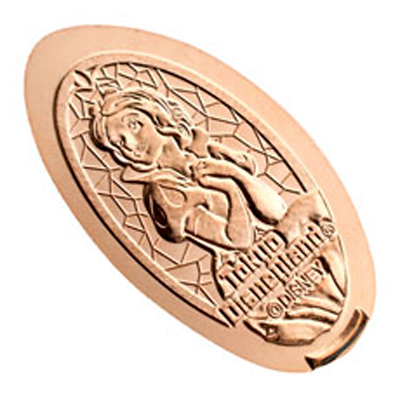 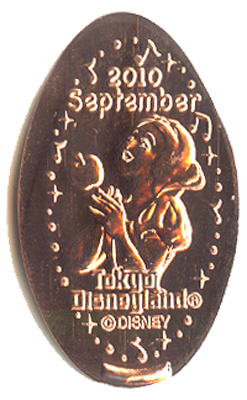 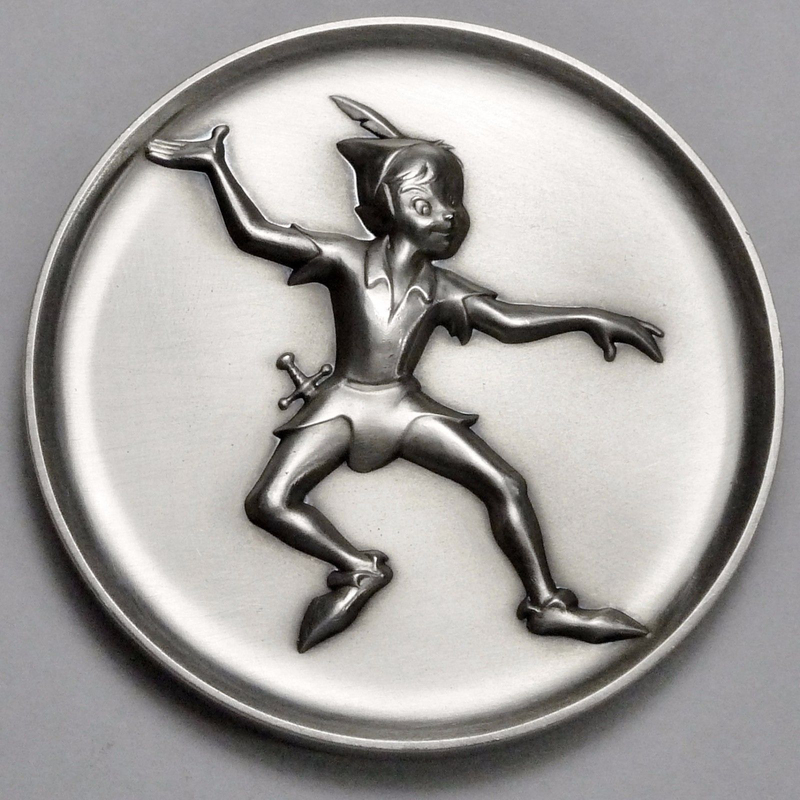 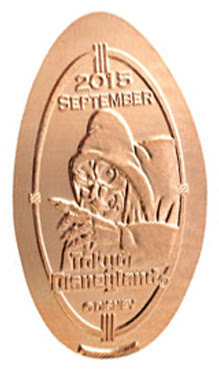 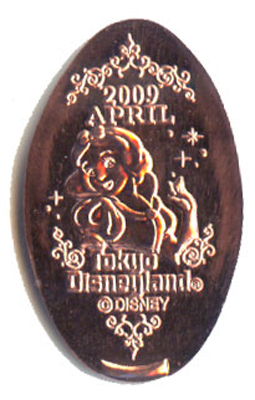 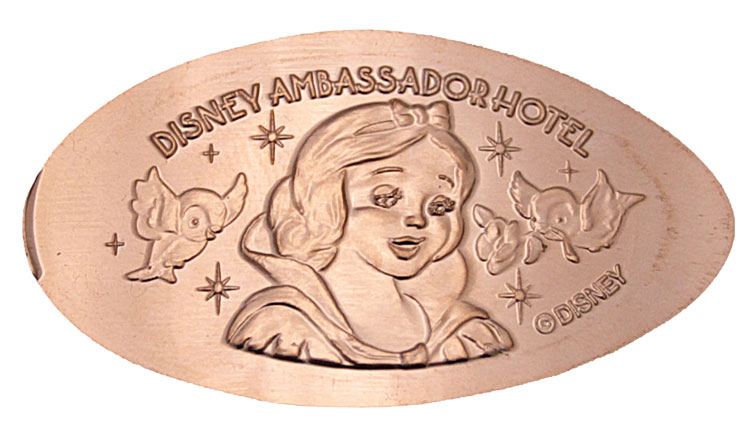 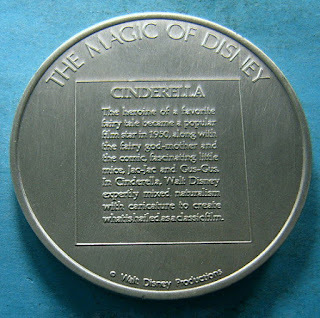 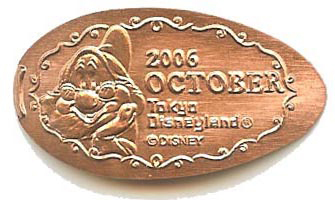 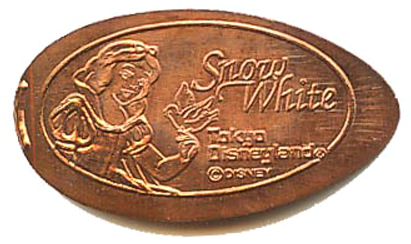 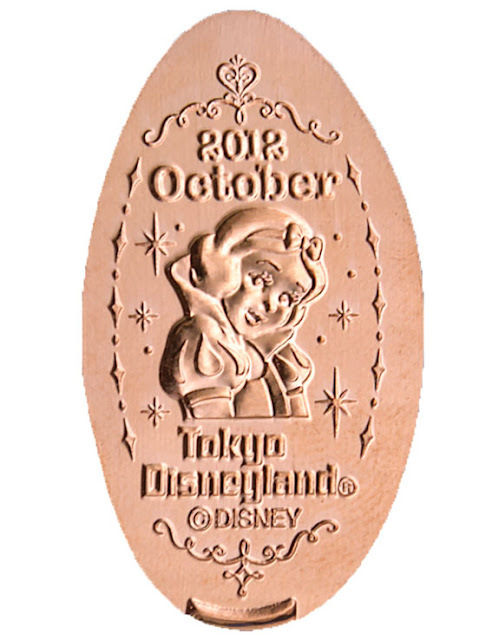 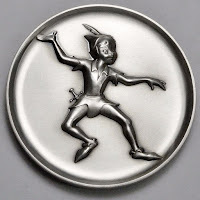 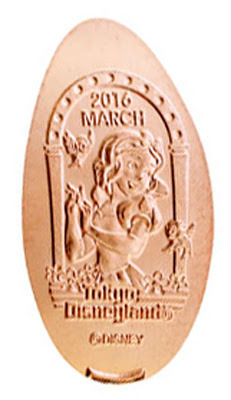 This may not be a complete list of all the Snow White pressed coins from Tokyo Disneyland, yet it's close, and it covers the ones we've come across so far. 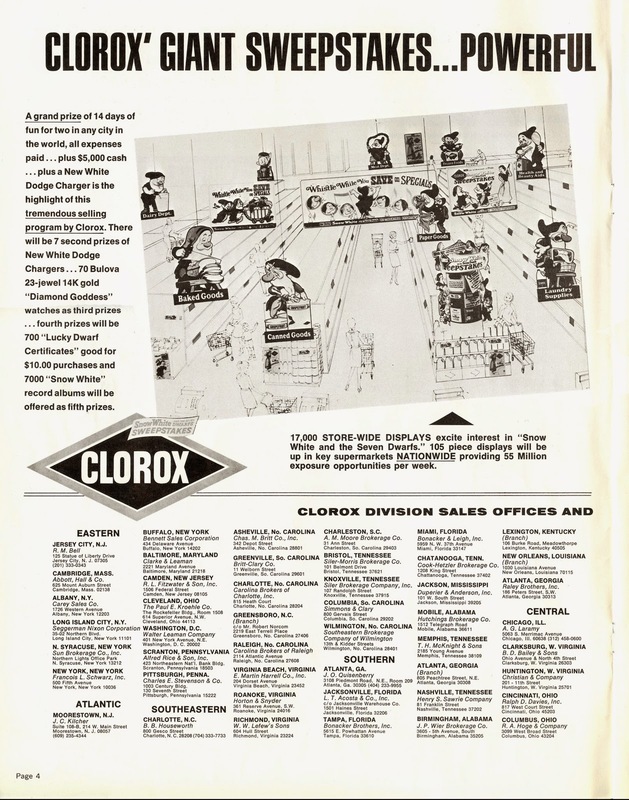 Starting in June of 1967, the Clorox Company ran a Snow White sweepstakes in conjunction with the re-release of the film to US cinemas that year. 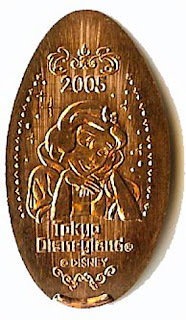 Thousands of prizes were available. 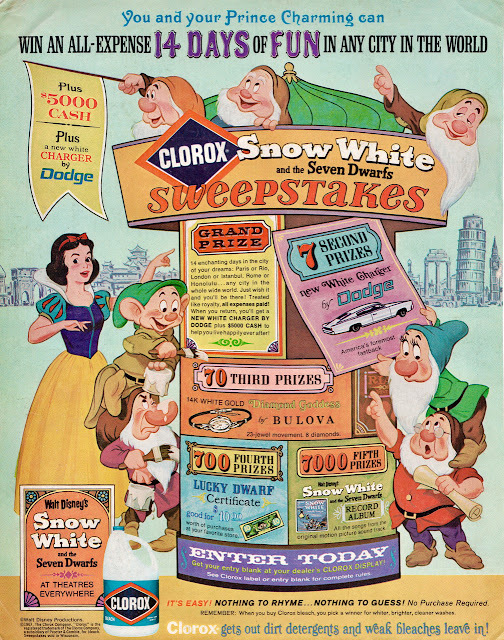 The grand prize included an all-expense 14 day trip to any city in the world, plus $5000 cash, and a new white Dodge Charger. Other prizes included seven second place winners of the Dodge Charger, 70 third place 14k white gold Bulova watches, 700 fourth place $10 gift certificates, and 7000 fifth place Snow White record albums. Free entry forms were available at your store's Clorox display. 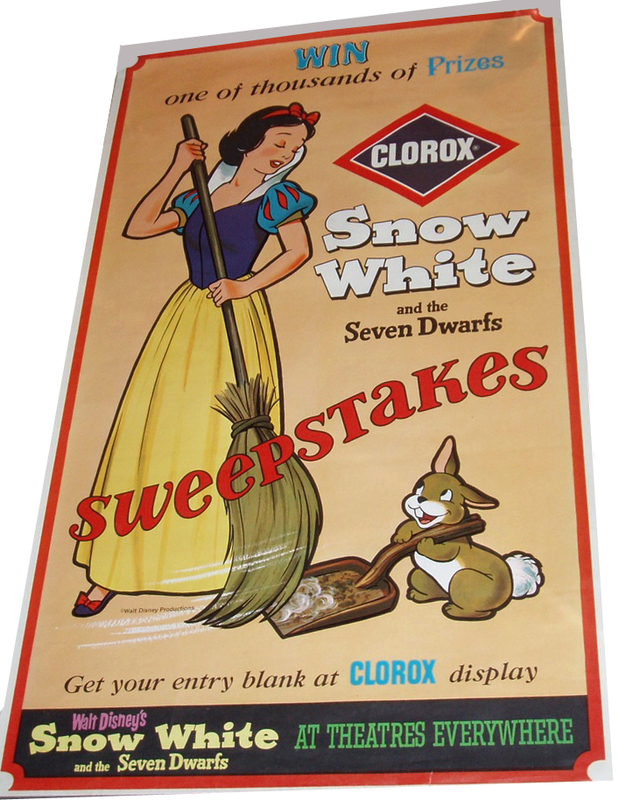 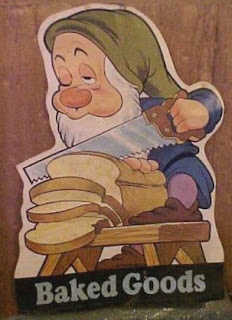 This Snow White poster promoted not only the sweepstakes but also the re-issue of the film. 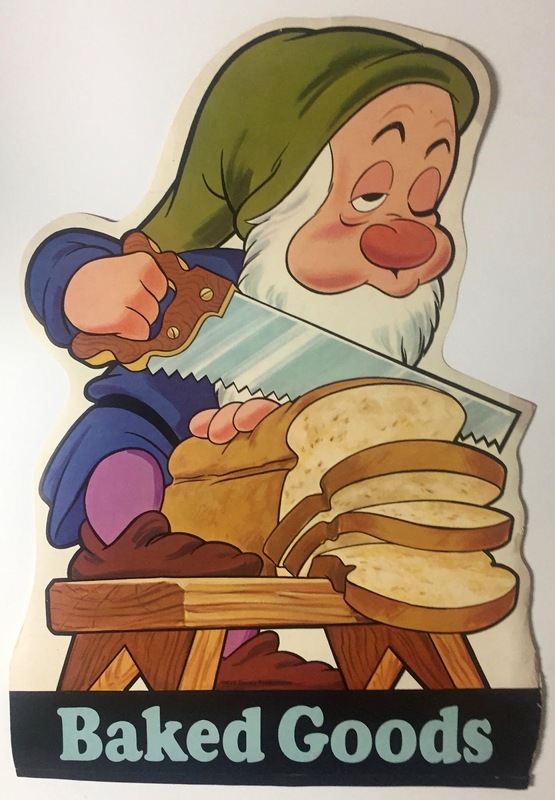 Measures approximately 24" x 36". 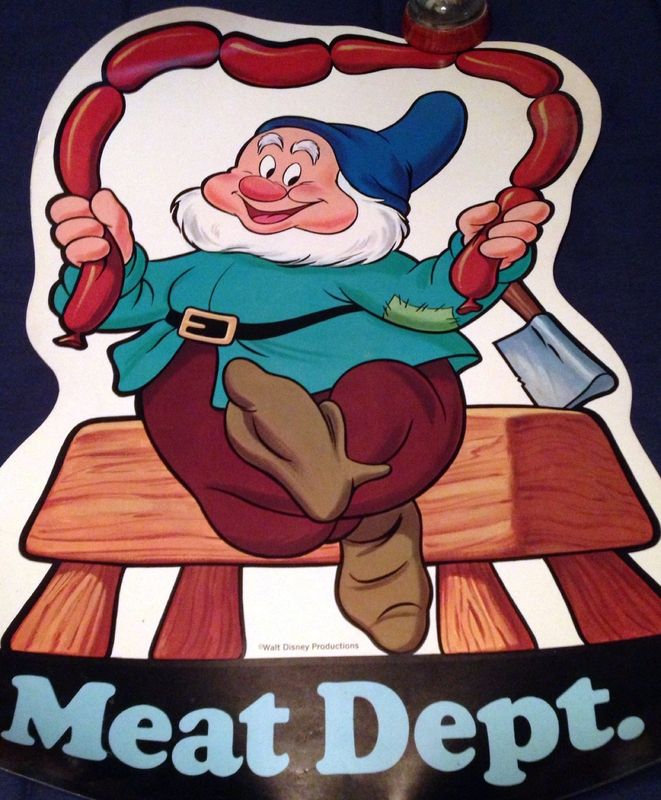 Poster image courtesy of Dan Goodsell. 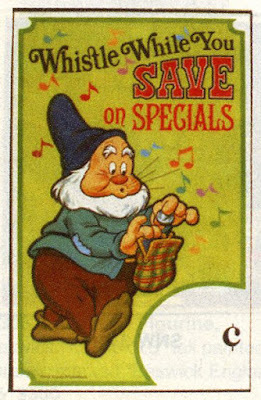 Cinema owners would learn of the promotion on a two-page spread in the 1967 Pressbook Merchandising Supplement. 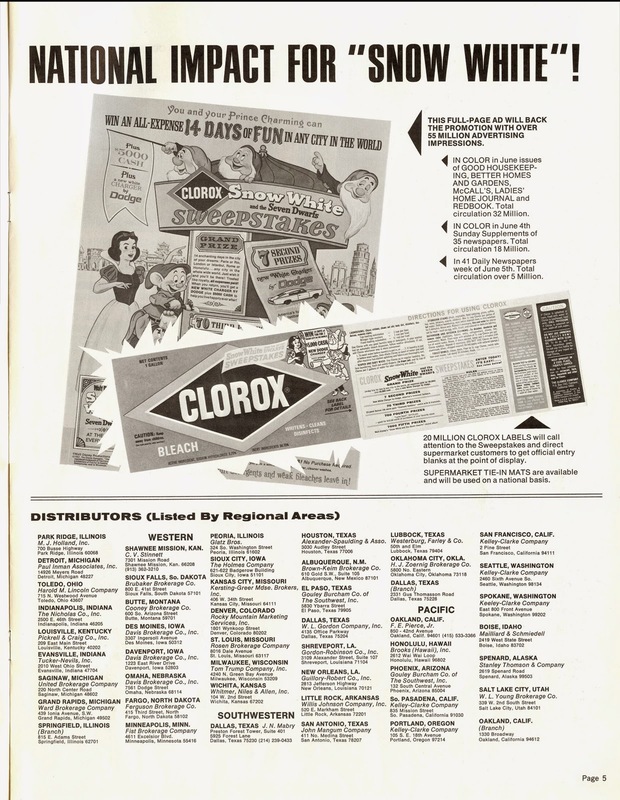 A 105-piece display setup was available to supermarkets nationwide. 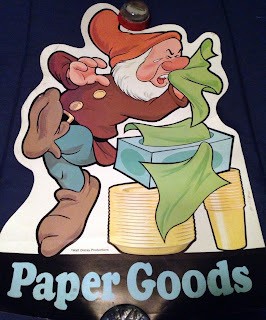 It included an array of posters designed to be located throughout the store. Various "Whistle While You Save" banners and posters were placed above aisles and on endcaps. 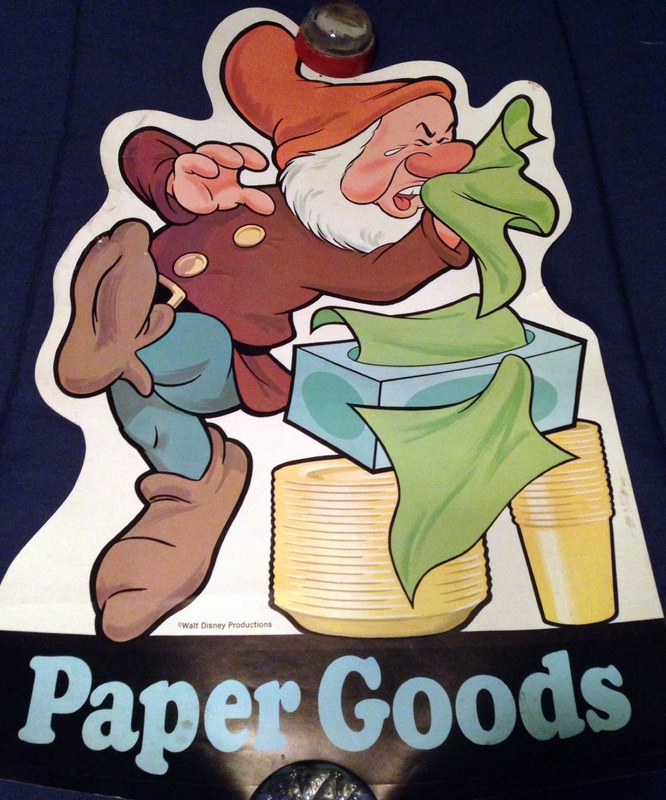 Small posters: approximately 12" x 21". 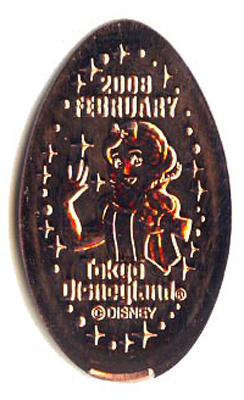 Small poster image via Hake's Official Price Guide to Disney Collectibles, 2007 (p.860). Six to seven days before the June 11th opening of the film, a full-page ad for the sweepstakes went out in over 55 million magazines, daily newspapers and Sunday supplements. 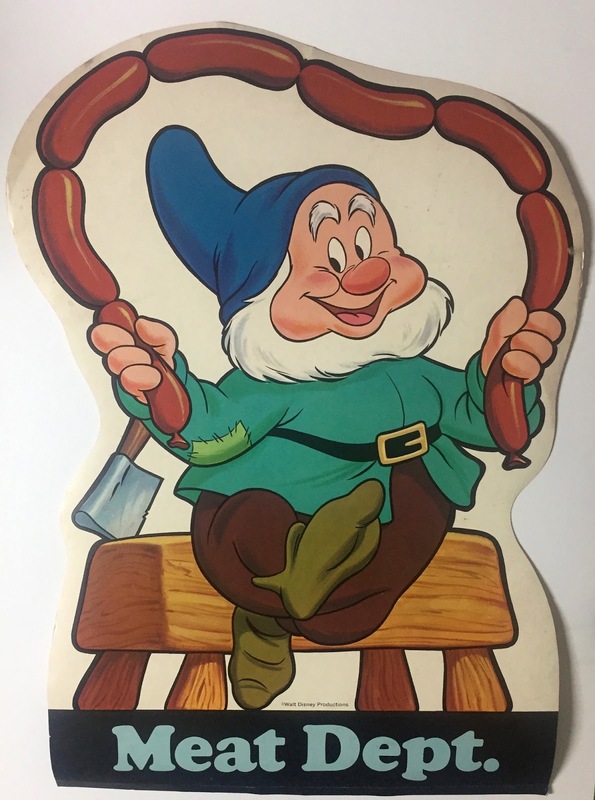 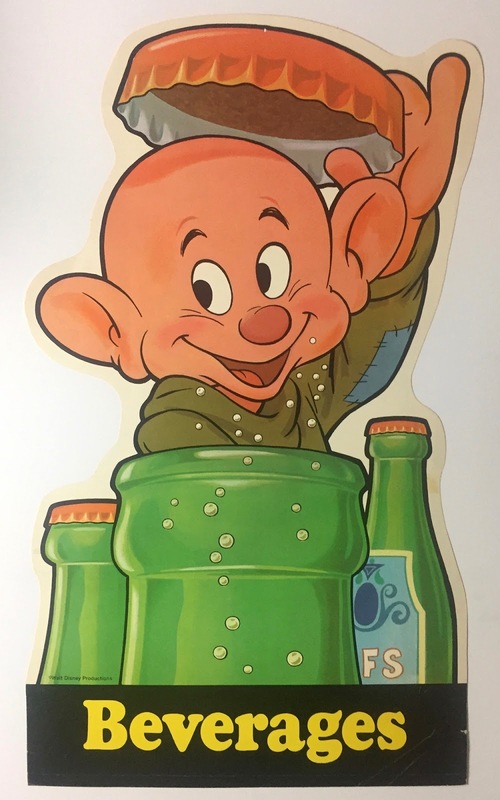 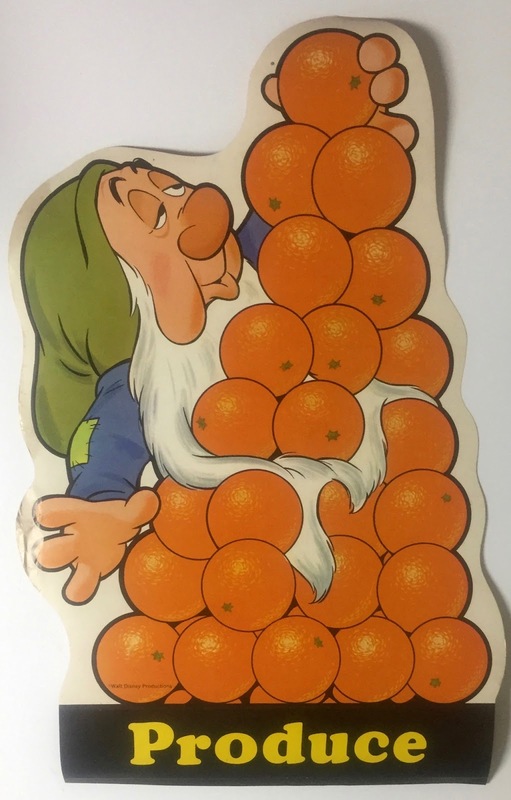 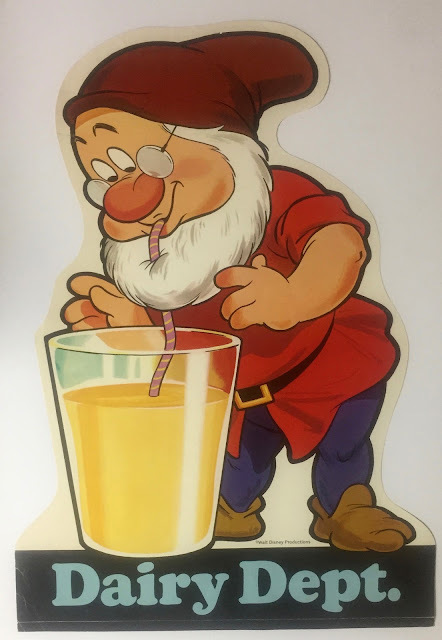 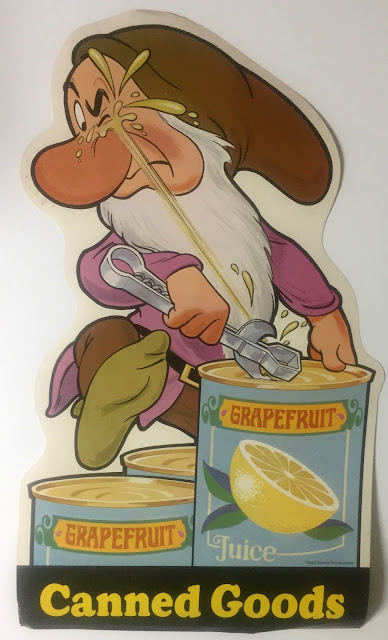 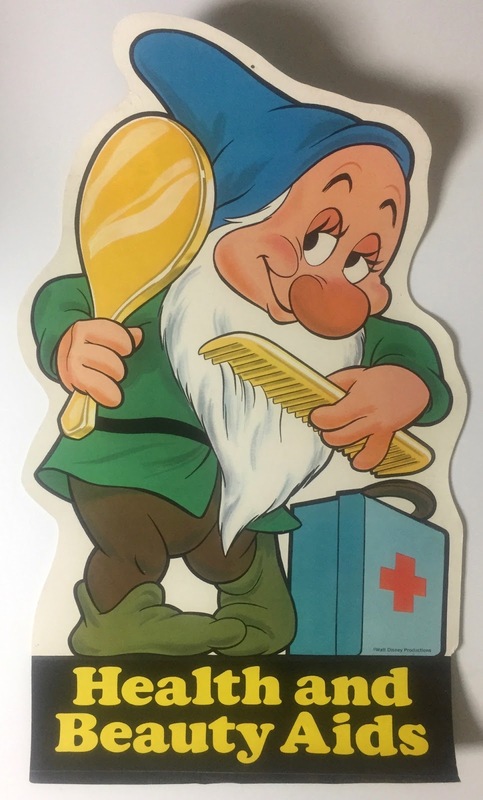 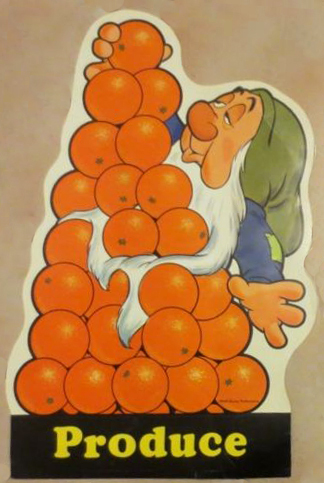 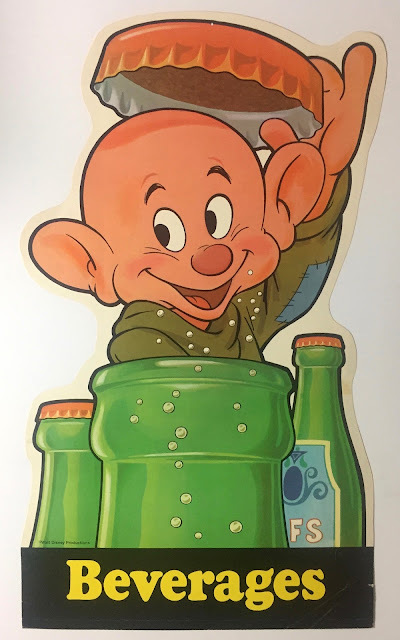 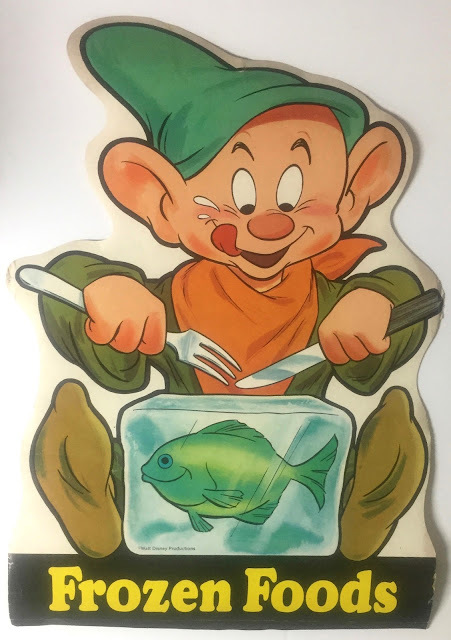 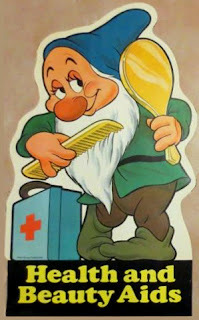 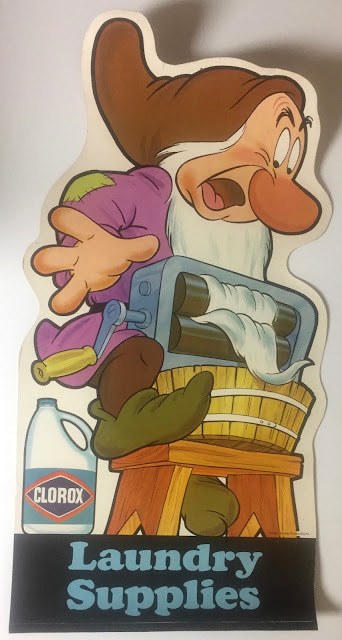 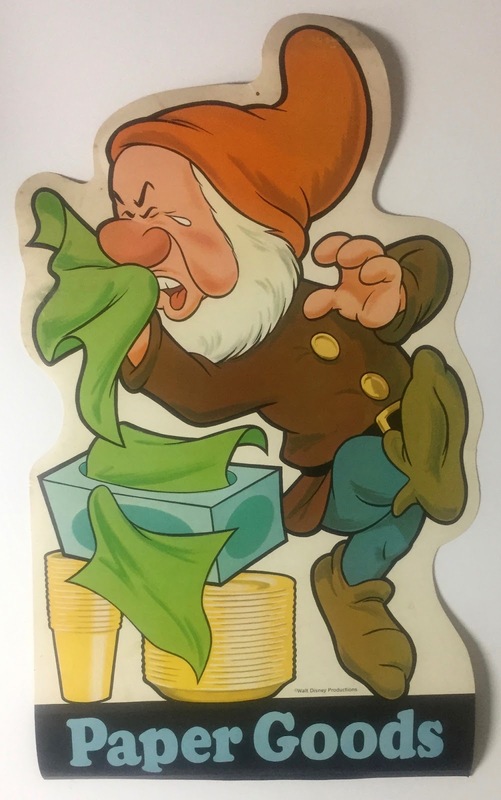 The ad and the majority of the Seven Dwarfs die-cut displays pictured in this post are courtesy of the Kevin Hicks Collection.